Sometimes, in the heat of the summer, on a sweltering day when relief from the sun would be welcome in any form, you get a chance to have a Popsicle. It is cool and sweet and has no nutritional value except that it is full of sugar and it will energize you. 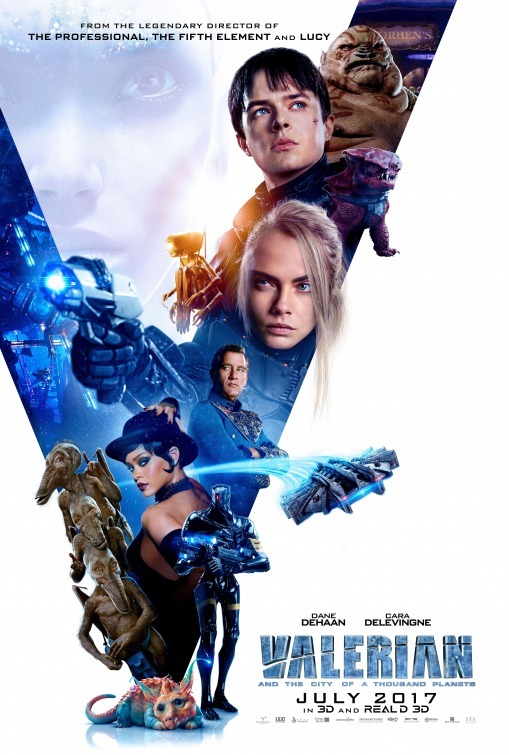 That's exactly what I wanted "Valerian and the City of a Thousand Planets" to be. Disposable summer fun that I could savor for a couple of hours before getting back to chores, work or other family obligations. Well, it did not quite work out that way. Sometimes that "Big Stick" Popsicle is more slimy than you anticipated, or the "Bomb Pop" has watermelon flavor instead of cherry in the red, white and blue version you eyed in the back of the freezer compartment. It's still cool and sweet but instead of satisfying, it disappoints. "Valerian" is a technical marvel to look at. There are creative and inventive ideas in every frame and the movie is a wonder to behold. The best things about this movie can all be seen in the visuals shared in the trailers. The graphic novel that the film is based on may have originated some of these concepts, I don't know because I am completely unfamiliar with it. The director Luc Besson, is the guy who brings it to life here and you can tell his vision is a big part of the film because so much of it feels familiar from the Besson film "The Fifth Element". The backgrounds are overstuffed with details, the aliens are grotesque and oddly beautiful at the same time. Images are mixed and layered on one another in deep and interesting ways. When people write about "world building" in films, this is a place they can go to for an architectural lesson. The problem is that it is all form over substance. We have no idea why things work they way they do or how any of it might matter. If you thought Chris Tucker was the best thing in the "Fifth Element", than maybe this film will make sense to you. I still am unsure why a three headed character with distinct bodies, knows anything about what is going on, but if a clue or exposition moment is needed, these duck-like refugees from Jar Jar Binks gene pool will show up and provide it, arbitrarily. That's the thing I find so frustrating about this movie. It is arbitrary in the story telling and character development. Valerian and Laureline are partners, but are they romantically involved? They may be, but it could just be that this is coming up for the very first time. We get no context and Laureline seems irritated at the mere suggestion that it could be the case, and then proceeds to act as if they have a deep romantic relationship anyway. The characters bond with tactical partners momentarily, but when those creatures or people die, there is often not even a shrug of the shoulders to indicate that there was any connection at all. The only one that does get a half moments consideration is the character of Bubble, played by Rihanna. After a completely unnecessary showcase for the talents of Rihanna and the visual effects team, that character is disposed of as soon as the plot deems it unnecessary. Imagine if after dropping off Luke and Obi-Wan, Han Solo exited the story never to be heard of again. That's the kind of thing that keeps happening here. If the film had matched the first ten or fifteen minutes during it's entire running time, it would have been great. The problem is that the film goes on for another two hours without the same kind of character development or empathy. Once the David Bowie song is finished and the planet Mul is gone, the rest of the film feels like a clockwork orange, designed to be clever but accomplishing nothing but dreariness. If you turn off the sound and play some Pink Floyd or Vivaldi for the rest of the movie, i think you will find it a lot more tasty. As it is, after a couple of bites you will realize that this is not the ice cream treat you wanted and buyers remorse will settle in. When is Guardians Vol. 2 available for home video?